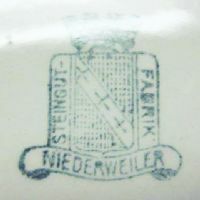 Very often items marked as Steingutfabrik Niederweiler are claimed to be products from the far better known French factory in Niderviller which in its time was often German or occupied by Germany and during those periods also carried the name Niederweiler. But we are here talking about a Swiss factory that got its name from the founding family and there is no connection between the two companies no matter how hard some people try to pass items with the Steingutfabrik Niederweiler mark off as being from the German WW2 occupation period, hoping to cheat people into believing they would receive a French Niderviller. The 'Steingutfabrik Niederweiler A.G.' (with its main office being located in Rheinfelden) was founded in 1906 by a family originally from the Lorraine that had moved to the town of Möhlin because of the perfect conditions for opening a mine there. They later on also encouraged specialized workers from the Lorraine region to immigrate and soon these were able to educate the Swiss workers, greatly increasing productivity and quality. 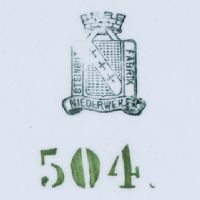 The corporation under main director Jules Hermann had its main office in the town of Rheinfelden and next to various stoneware and semi-vitreaous porcelain household utiliies the factory concentrated on decorated and blank dinnerware. However the product range was more of the well tried old-fashioned sort and even if orders kept the company going it was obvious that other companies had a far better touch when it came to satisfying customer needs. All changes tried under Jules Hermann were merely of cosmetical nature and did not really change anything. Not only for that reason shareholder Louis Dryander in 1937 became main director and instantly started to restructure the business, knowing that the company was running right into trouble if it not quickly adapted to the changing markets. The number of employees rose to its all time maximum of 80 people in 1945 and in 1946 the factory owned an own art ceramics section which tried to create normal household wares with an 'art pottery' touch. Shortly afterwards the old coal-fired kilns were finally replaced by electric kilns which drastically increased output that in turn finally managed to slowly catch up with the rising demand at that time. But all that did not change the fact that other companies not only in Switzerland produced much cheaper and reacted faster on changes in taste, meaning that the factory was forced to close in 1956. 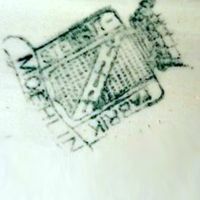 Crwoned shield flanked by 'STEINGUT-' and 'FABRIK' above 'MOEHLIN'. 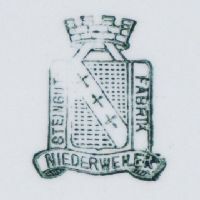 Crowned shield flanked by 'STEINGUT-' and 'FABRIK' above 'NIEDERWEILER'. Near perfect example of the same mark, top left corner is missing. Same as the previous mark only this time also showing a typical item number addition.